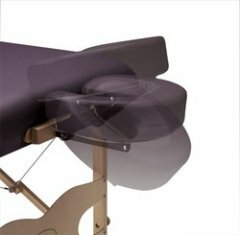 Experience the most comfortable portable massage table in the world. Omni Massage Tables feature Touch Response memory foam and Duratouch (ultratouch) fabric for unmatched comfort. Standard Reiki End panels offer optimal access. Built to be rock solid yet luxurious, we feature and an engineered inverted truss and premium cable lock system for unrivaled working weight load performance throughout your career. 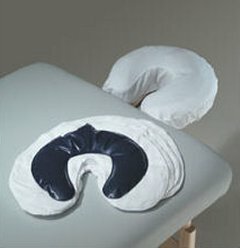 Add Breast/Scapular Recesses or the prenatal feature to make this the ultimate experience in comfort for your clients. Backed by the Custom Craftworks lifetime warranty. An optimal four-layered foam configuration for deep comfort and support without pressure, our Touch Response Foam System gives your clients a luxurious table experience like no other. This exclusive foam system is fluidly molded to the contour of the body by the weight of the client. Provides support that is as nurturing as it is luxurious. 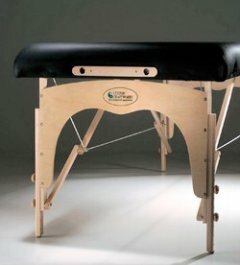 Dual Action Face Rest A great choice, this popular face rest tilts and elevates above the surface of the table, accommodating large breasted or barrel-chested clients by effectively bringing the face rest up to the client. The Dual Action also elevates to support the head in face up positioning. 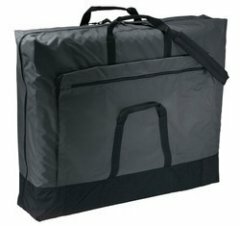 Simple to use, lightweight and folds flat for easy storage under the table. 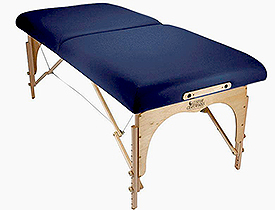 The Reiki end panel allows more room for close, seated work. Here's the extra support you need! Our most popular, the Ankle Bolster is wrapped in soft DuraTouch Urethane, and has a variety of uses. It is a necessity for any practice. 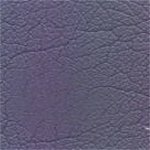 Duratouch is luxuriously supple and upholsters beautifully. It offers Excellent cleanability and durability with a Slip-resistant surface that holds sheets better. TABLE WIDTH: Tables are available in width of 28", 30", 33" and 36". Please note that extra wide tables (width over 30") will not qualify for QUICKSHIP handling. TABLE LENGTH: Tables are available in lengths of 73" or extra long 78". Please note that extra long tables will not qualify for QUICKSHIP handling. An extraordinary advancement in positioning women comfortably, our exclusive Breast Recesses option does much more than relieve pressure on a client's breasts. With this option, the torso is positioned neutrally, the scapula are closer together and the muscles are shortened for easier access with less resistance. Profoundly increases comfort and treatment effectiveness. You'll find people coming back to you for this table experience! 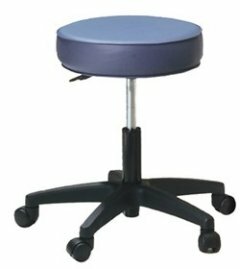 Sit down and rest your feet with our high-quality Rolling Stool. With height adjustments from 19" to 27", it allows you to work comfortably while maintaining good body mechanics. And with its smooth rolling casters, you can glide eaisly from point to point. Available in both Levante and Duratouch Upholstery, when ordered with a table package, it will be upholstered to match your table. When ordered alone, you can select the specific upholstery to be used. Height Range: 19" - 27"
This sheet set is made up of 100% Cotton Flannel Sheets including 1 fitted and 1 flat, 40 thread count. They are designed to be used with Custom Craftworks tables, and make a great companion with our fleece pads and table warmers. If prenatal massage is a part of your practice, this option is a must for you! Now it's finally possible for the mother-to-be to relax comfortably in a face-down position during massage therapy. She will love you for it! This innovative new table is the result of extensive research and development by nurse-midwives, massage therapists, engineers and Custom Craftworks. It is the best prenatal table made anywhere. 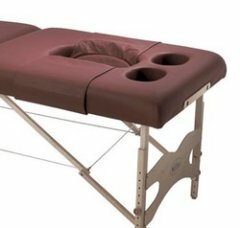 No other massage table offers these exclusive features. Simply insert the provided plugs to restore a flat working surface for other types of massage therapy. If prenatal massage is a part of your practice, this table is a must for you! The Ultimate in comfort! Our Gels gives you a soft, malleable surface that eaisly conforms to the contours of the face. These interchangeable gel packs for hot/cold therapy work great with our flannel face rest gel covers. 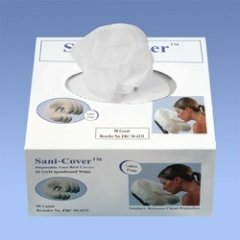 The gel can also be used as a cervical therapy wrap! Invite your clients to relax in the gentle heat of our Table Warmer. Our Table Warmer lets you work in a cooler room while keeping clients warm and comfortable. Custom Craftworks products are guaranteed to be free from defects in material and workmanship to the original customer. Our warranty is valid with proof of purchase. Different components and products of Custom Craftworks carry different warranty time line. Please see product info or contact Customer Service for more details. Custom Craftworks, at their choice, may elect to repair or replace any of our products covered by this warranty. This includes the warranty provided by the manufacturers of the foam (5 years) and the fabric (3 years). The warranty does not include damages caused by improper set-up, accidents, improper storage, misuse, or tears or cracks in the upholstery. The customer shall be responsible for the proper set-up and use of the product. Under no circumstances is Custom Craftworks liable for any direct or indirect costs or damages. The warranty is invalid and Custom Craftworks' liability terminates if modifications or repairs are made to the product without the authorization of Custom Craftworks. Custom Craftworks, Inc. reserves the right to inspect claimed defective products. No returns, replacements or repairs may be made without prior written consent. Please do not return any product to Custom Craftworks without first contacting Customer Service for a Return Authorization number. Products returned without a Return Authorization number will be refused back to the customer at their expense. Some replacement parts may vary from those originally supplied and are subject to availability. Customized or discontinued products and options may not be available for replacement. In the event of warranty-related returns and exchanges, Custom Craftworks will provide standard return shipping back to our customers within the continental U.S. in accordance with the Custom Craftworks Warranty Guide. The customer is responsible for return shipping charges of stationary and lift tables. International Customers should consult with Custom Craftworks directly, since the international warranty may vary from the U.S. warranty. The warranty outlined herein is the sole and exclusive warranty provided by Custom Craftworks. There are no other warranties or guarantees provided by Custom Craftworks, either expressed or implied, including any warranties of merchantability or fitness for a particular use. Incidental or consequential damages are excluded. Custom Craftwork does not assume any other liability in connection with the sale of their products. If you have a warranty related question or concern, please e-mail Custom Craftworks directly at info@customcraftworks.com.